I just returned from a quick trip to Peru to update work on a couple of projects. While in transit, I completed a paper that summarizes the past 7 years or so of co-creative work at the C.H. Nash Museum at Chucalissa. The paper is part of a volume that Beth Bollwerk and I are editing for the Advances in Archaeological Practice journal based on a session we organized for the Society of American Archaeology annual meeting this past Spring. All of the above help solidify in my mind some lessons on co-creation. A SWOT (Strengths, Weaknesses, Opportunities, Threats) Analysis and five-year Strategic Plan created by Claudia Tullos-Leonard and Elizabeth Cruzado Carranza. The plan responds directly to the community expressed need for cultural heritage, educational, and tourism opportunities in the rural Andean community. Claudia brought her considerable business expertise from the private sector and Elizabeth her five years of work in Hualcayán to create the plan. The Peruvian community will take the next step to assess and refine the proposal. A series of timeline banners for the newly opened Museum created by Christian Roesler and Mariah Selitsch. 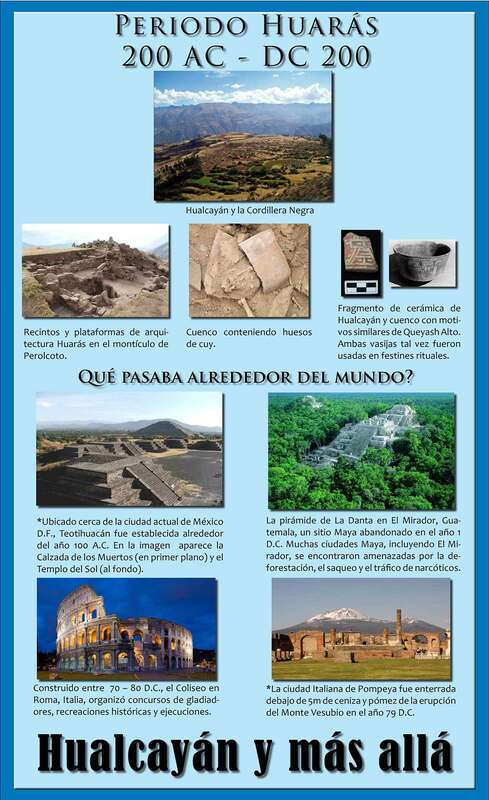 This past summer Hualcayán high school teacher Leodan Abanto Alejo Valerio expressed the need for a resource that linked local, regional, and international events from prehistory to the present day. Christian and Mariah used their graphic and archaeological abilities to produce a series of six banners. In a meeting this past summer, Leodan also expressed the need to document the history of the Hualcayán village. He noted that the government issued textbooks covered national and even regional Peruvian history but contained no information on the local community. (This situation is very similar to my experience in Southwest Memphis that prompted an oral history project in that neighborhood.) For Hualcayán, Lacy Pline and Merrileigh Rutherford created a proposal to install a complete oral history program and station to both record and view collected interviews – all at a cost of under $1500.00! They drew on their research interests coupled with internships at the National Civil Rights Museum where a similar program was conceived. I have posted before about the oral history program launched this past fall in Hualcayán. 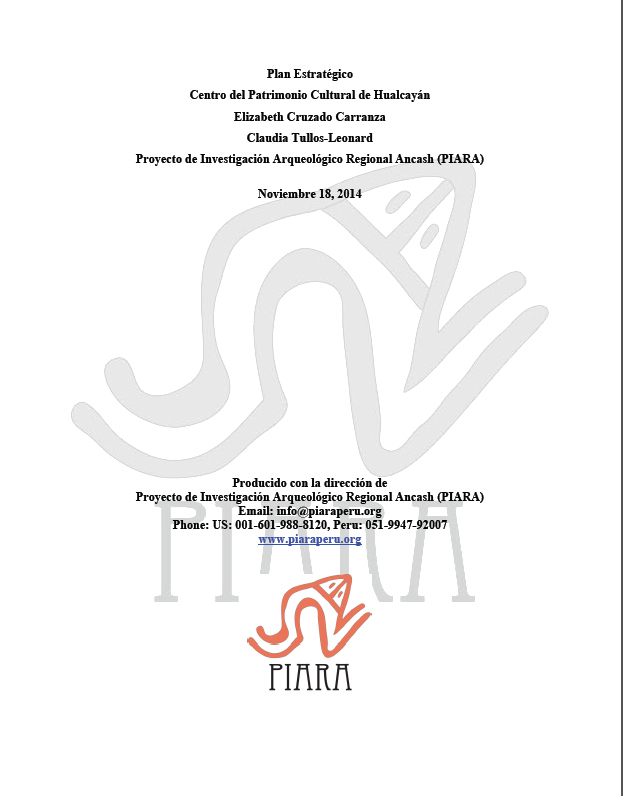 The website and other social media outlets for Proyecto de Investigación Arqueológico Regional Ancash (PIARA) were completely revamped and upgraded to reflect current best practices by Remi Chan and Brooke Garcia. Although not an expressed community need, the upgrade does allow for a more effective communication of activities in Hualcayán and prepares for anticipated internet capabilities for village residents. Other completed projects by the Museum Practices students included a marketing plan for the Women of Hualcayán craft artisans, a short video on the importance of archaeology preserving cultural heritage, a follow-up to the successful quipu project from this past summer, and several school lesson plans for use in the coming year. The activities foster reciprocal relationships where the needs and interests of the community/students/archaeologists/museum professionals are equally supported and valued. Creating the noted products is not possible without the full participation of all partners. All partners expressed needs benefit equally. As an applied anthropologist, I seek to address real world concerns beyond the walls of the academy and present that perspective to my students. In end of the semester evaluations, Museum Practices students consistently report that creating something that lives in the real world is a highlight of the class. Coupled with the above, the created products follow best practices for the rural Peruvian context. The completeness and professionalism the students brought to their projects was no different from had they created products for a major metropolitan museum in the U.S.
Co-creation enhances the stakeholder role of all participants for a long-term commitment to the process. Next week I will post on the January trip to deliver the products to the community in Peru. ← And even more on public dollars and museum support . . .
Post on University of Memphis class projects for the Museum in Hualcayán . . .